The Mom Conference Starts Tomorrow! 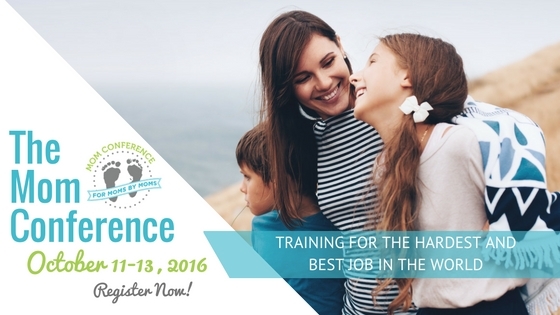 The Mom Conference is happening tomorrow…and you can still attend! Wouldn’t it be nice if you could attend a conference where some of the world’s top authors and speakers would offer you answers to all your most pressing parenting and self-help questions? Well, you can. You don’t even have to get a babysitter or travel anywhere. And it’s FREE. Power of Moms and Unconventional Kitchen, have gathered 20 top-notch speakers to present about topics every mom needs during the FREE 3-day Mom Conference, on October 11th, 12th and 13th, but you can start watching today! Starting today and each day of the conference, you can watch the seven presentations for that day at your convenience – while your kids nap, while you fold laundry, whatever works for you. Ashley and I are speaking TOMORROW on Keeping Your Identity in an Entrepreneurial Home! Click below to see the full list of speakers and find out who you’re most excited to hear from. Click on the image to see the full schedule of speakers! Looking forward to hearing how you were impacted by The Mom Conference!